One of the hazards of movie comedy is that it's almost impossible to be sure that what reads funny will look funny. 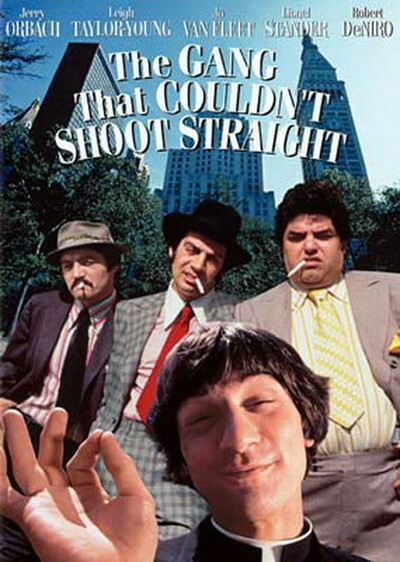 "The Gang That Couldn't Shoot Straight," an uncertain comedy based on Jimmy Breslin's funny novel, supplies plenty of examples. We laughed when Breslin told us that one of the big responsibilities of a Mafia man's wife is to start his car in the morning - to be sure it wasn't wired with a bomb. But when the movie uses this notion, It doesn't quite work as well. The Mafia wife gets into the car, crosses herself, starts it - and no bomb. Inside the house, the Mafia don is crouched under the breakfast table. When he hears the motor running, he stands up. But it simply isn't as funny on the screen as it was before. Maybe part of the trouble is James Goldstone's direction, which tends toward the heavy-handed. Instead of putting the Mafia chief under the table, for example, why couldn't he have used a simple close-up, showing the guy closing his eyes, tensing, and then relaxing? This would have drawn the audience into a sympathetic bond with the character; by using slapstick exaggeration, Goldstone loses us. We get lost more than once. The movie is loosely strung together around a small feud between old Baccala (Lionel Stander) and the young upstart Kid Sally (Jerry Orbach). There is a romantic subplot between Kid Sally's sister (Leigh Taylor-Young) and an Italian bicycle racer (Robert De Niro). But the feud is so casually delineated in the screenplay that we can hardly follow it, and romantic subplots (as everyone should know by now) are fast becoming the death of movie comedy. Still, the Breslin novel provides a rich source of raw material, and some scenes almost work in spite of themselves. It's funny when a Mafia midget is dispatched to run Kid Sally's pet lion through a car wash. The idea is funny, anyway. But Goldstone has the midget and another guy pull the lion through. Wouldn't it have been funnier if he'd made full use of the location by simply hooking the lion's chain onto the endless belt and letting the lion get pulled through like a car? Goldstone misses on some other scenes, too. Kid Sally rents an armory for a big bicycle race he's sponsoring, but there are labor troubles and the racetrack isn't completed. The race starts anyway, and a racer flies right off the end of the uncompleted track and through the air. This could be funny (remember Peter Sellers running through a window and landing in the water in "The Pink Panther"? ), but Goldstone handles it so badly visually that we are left with the distinct impression that we're watching a stunt man doing a stunt; nothing else.